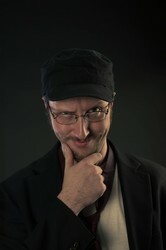 Doug Walker is best known for his character The Nostalgia Critic who resides on ChannelAwesome.com. The "NC" reviews bad movies and TV shows connected to childhood. He's also noted for having a long standing "rivalry" with The Angry Video Game Nerd. He has appeared on PBS, 20/20, Rifftrax, and in Entrepreneur Magazine and the New York Times. Additionally, he was awarded Entrepreneur of the Year at the Mashable Awards as well as one of the Best YouTube Critics by WatchMojo.com. Having performed with Mike Nelson, James Rolfe, Mara Wilson, Dante Basco, Paul Dini, Andre Meadows, Rob Paulsen, Maurice Lamarche, and Don Bluth, his work was praised by the late Roger Ebert. His image even appeared in the anime Zettai Karen Children. He's more than a god, but less than a man... or is it the other way around? Either way just watch him! He clearly needs the attention.